Skin testing helps to identify the allergens that are causing your symptoms. 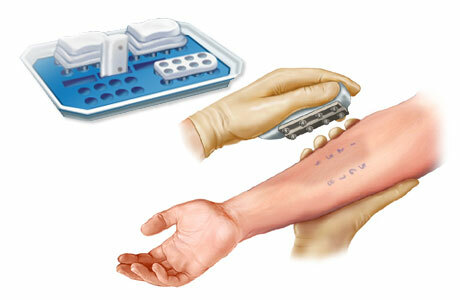 The test generally involves applying an extract of an allergen to your skin with the multiprick applications (no needles are used), then evaluating the skin’s reaction. Tell us about all medicines you are taking, including over-the-counter drugs. Since allergy medicines, including over-the-counter antihistamines, stop allergic reactions, you should not take them for a few days before the test. Talk to your doctor about discontinuing your allergy medicines prior to the test. You will be given a list of medicines to avoid before the test, because there are other drugs that can interfere with the results. The allergy skin test itself may produce mild itchiness. Although small amounts of allergens are introduced into your system, an allergy skin test is safe when performed properly. Systemic (whole body) reactions to skin testing are extremely rare. After the allergy skin test, any extracts and ink marks will be cleaned off your skin with alcohol. A mild cream may be applied to your skin to relieve any excessive itching at the sites of the skin pricks..
We will use the results of the test to help develop a management plan for you.